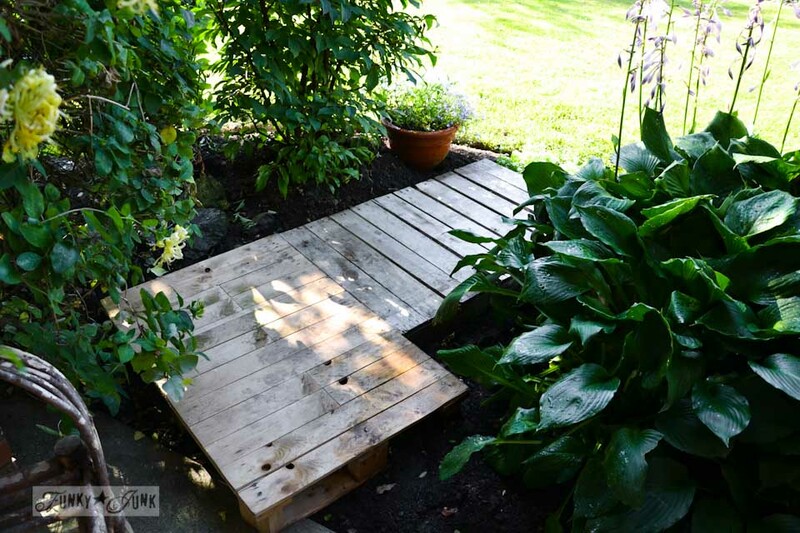 I had a thought… would a pallet garden walkway work in this area? 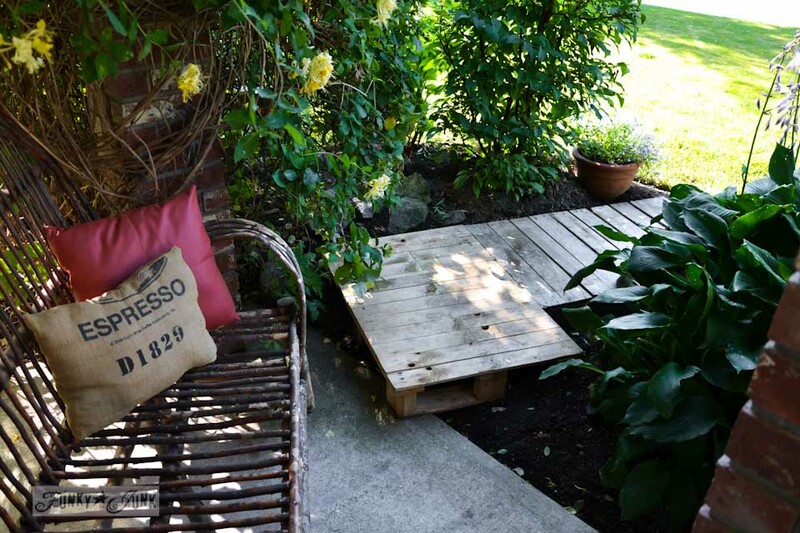 I have this lovely little sitting area on the front of the house, that has a tiny walkway leading to the front yard. Only trouble is, the cement stepping stones really weren’t stepping stones but fencing, and they always sunk. MESS. I decided to do something a little more permanent, but easy. Having two small pallets in stock (I sound like a pallet store) (scrap that… I AM one! ), I had a brainstorm. 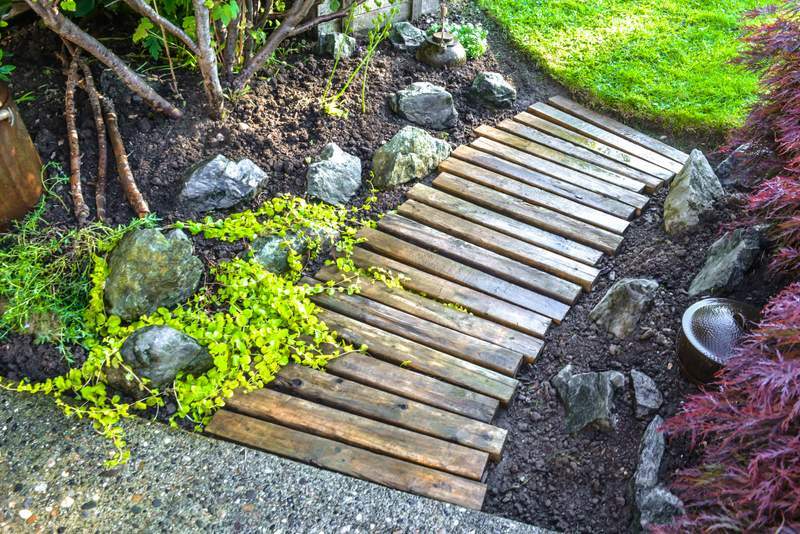 Would an easy 2 pallet garden walkway work? So I dug some trenches to level and straighten things up. Easy! Until I realized just how fussy two pallets of different sizes could be. They fussed and moaned and fought me. I could not get them to sit level in like FOREVER. I nearly quit and hauled the mess away but I was too busy flat on my back (truth) gasping for air in complete exhaustion. Strange how no neighbours ran to my rescue… guess I didn’t whine loud enough?! Then, much like a set of fireworks goes off, I decided these two baboons would not defeat ME. I (moaned and groaned) pulled myself together, dusted myself off and did it all over again. Pallets and me? We have a long term running relationship… this had to work. Or… I don’t know, but it HAD to work. The front yard is higher than the sidewalk, so a step up was necessary in order to have the pallets level. No big deal at all, it keeps the dirt and rainwater off your feet. And the sidewalk was a great support. 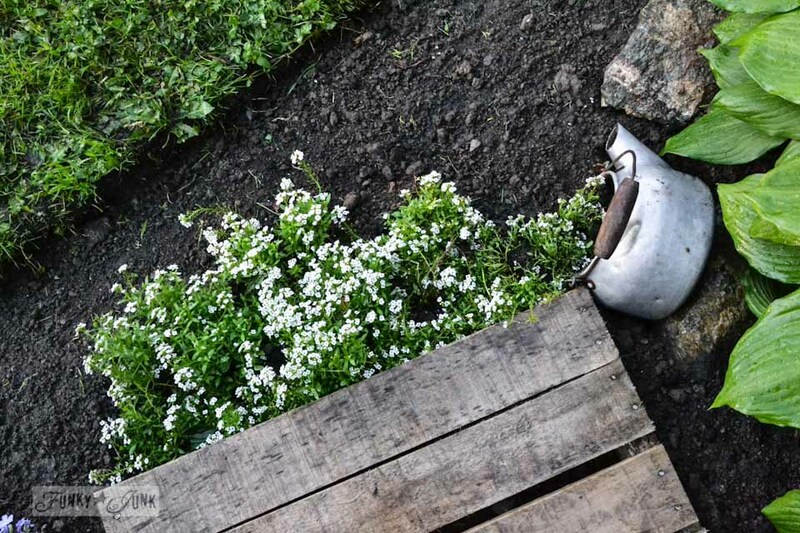 The front of the walkway got treated with a little tipped kettle of fragrant alyssum. It’s a good step from the lawn to the walkway but it’s comfortable and rather pretty. It works! I could have pulled the pallets closer towards the lawn, but I rather liked the flowers framing the front of the walkway instead. Why be predictable? See? It’s less boring that way. 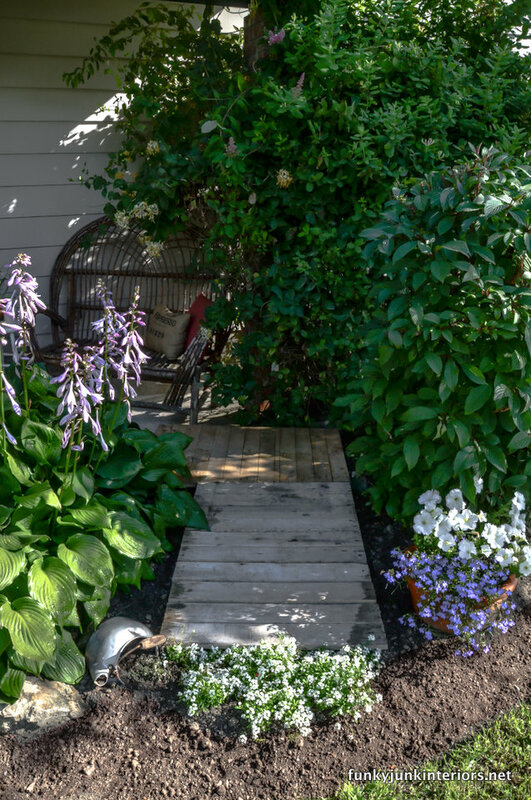 This little walkway was the perfect touch for this area. And it blends in really well with the plants and flowers. It’s truly perfect! And is the perfect place to sit for a coffee. Are you ready? It involves the BEST kept secret in the world. I mean… look at that height! I must be a major green thumb, right? You buy the biggest hanging basket you can afford and plunk it on top! The End. Trust me… I deserved the break. And in case you’re new here, this is my other pallet walkway. Wow… I’m honoured to be attributed to that quote… I LOVE that! Thank-you! And how I can relate with your less than stellar comment. This place has a LONG way to go to truly become me, but one small project at a time will eventually get you there. Go you! Ha ha ha. We just finished doing basically the same thing in our vegetable garden. Cheater style. Your first walkway was our inspiration. However after hubby spent an hour trying to take the individual wood pieces off, he gave up and said we were using the bases of the pallets – that they would be sturdier that way too. And he was right. One thing we added to the project – landscape fabric underneath to stop the multitude of weeds from growing through the slats. I love your solution to the barrel too – it’s the only way to go!! After all that trouble, I think your pallet walkway looks great! Well worth the work! Your new pallet walk way is genius. They say no pain, no gain. 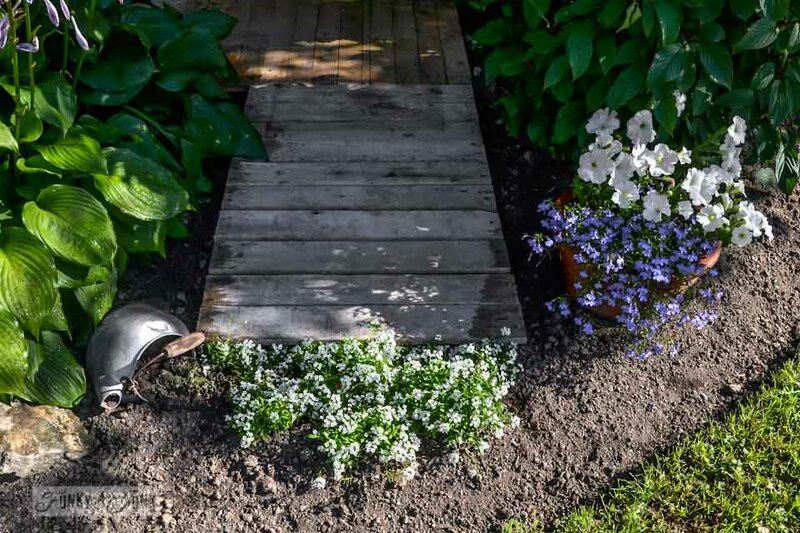 Maybe you could add two cute stepping stones to either side of the alyssum, leading to the front of the yard. This may help to make the step a little shorter. A pair of pretty mosaic steps would be lovely!! Very cute idea and I actually did attempt something similar! But since there are no small children in our household ( and I’m likely the only one that will ever use this pathway!! ), I think I’m going to try letting the flowers grow nice and full… I’ll take another pic at the end of the season! It’s not too bad if you level the ground first… I found the ruts didn’t work all that well. Level first and you’ll nearly be there! It looks amazing…you are so talented, and I just want to say, you truly inspire me to look around at what I have and make it work. You seem to have a knack for putting it all together and making it work…thanks for sharing all your projects so the rest of us can be inspired!!! I’m remodeling my garden so I’m learning, getting inspired and pinning like mad ;), with all suggestions I find. This one is pretty awesome. I don’t know if I’m already in that brave phase you are but I’m going to pin it and sleep on it for a while. Pallets?…why they are like deck sections…fantastic idea Donna…and you so beautifully landscaped around the walkway…and love your instant “green thumbs barrel”…Have a wonderful weekend! Great idea we have a fire pit in our back yard and I really want to make a walk way to it. And I had seen your first idea but was worried about the same thing, sinking. 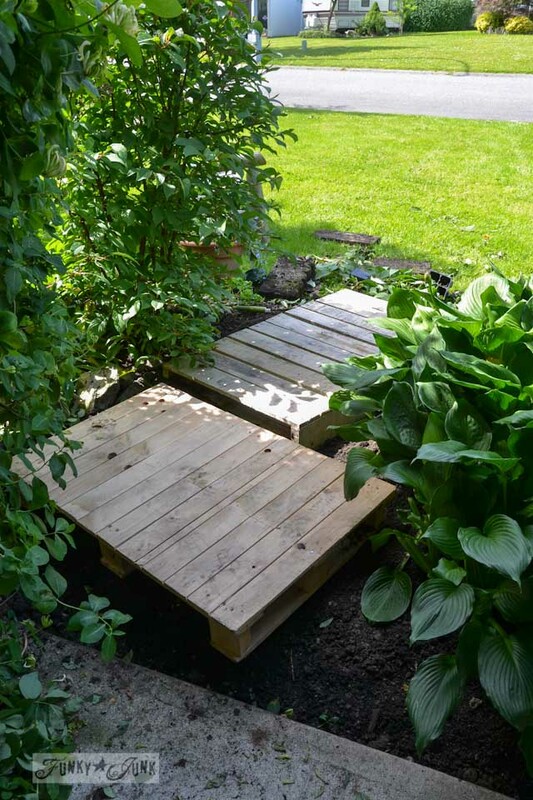 This has crossed my mind to mismatch pallets to create the walkway. But you put it in pictures for me!! Looks great!! Thanks for sharing! I can’t wait to see the bench placement Donna. I have been holding off on putting out one of the benches because I knew moving it every time “we” mowed the lawn, someone wouldn’t be happy.haha. Oh I so get it. It’s very hard work to accomplish something worthwhile. But the learning process in itself makes the journey worth it. Glad you kept going! It’s really the only way to accomplish. Quitting can’t be in one’s vocabulary… no such thing! Have any ideals for a full size headboard. Oh and I live this page thank you!! Nice walkway and I love how green your yard is! Those kittens are THE BEST. the way they hang out together is too sweet. Keep the pics coming I think they are into modeling. THE PALLET PRINCESS does it again! Perseverance paid off and you now have another beautiful spot where you can welcome the day. I accept that title… I earned it this round.. haha! Very, very nice! I love that! I love these ideas! We live on an old farm, and these would go great with our landscaping! Ohhh if I had the room, I would have just smacked all kinds of pallets down in a random fashion and left them. That would look so fabulous! You’ve done it again! That looks wonderful and I especially like the flowers across the front. Very cool! Thanks! It’ll get prettier as they fill in more too. Loving it so far! 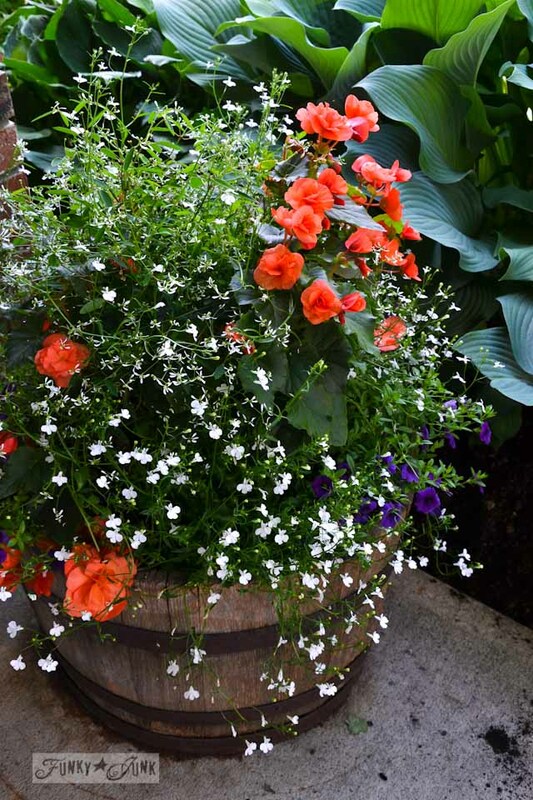 I also do that same cheat with the hanging baskets in a planter! IT’S SO EASY and looks FAB! LOVE this look and such a great use for pallets!! The cut out around the plants looks very nice!! We did this over a gravel area from a deck to the garage. 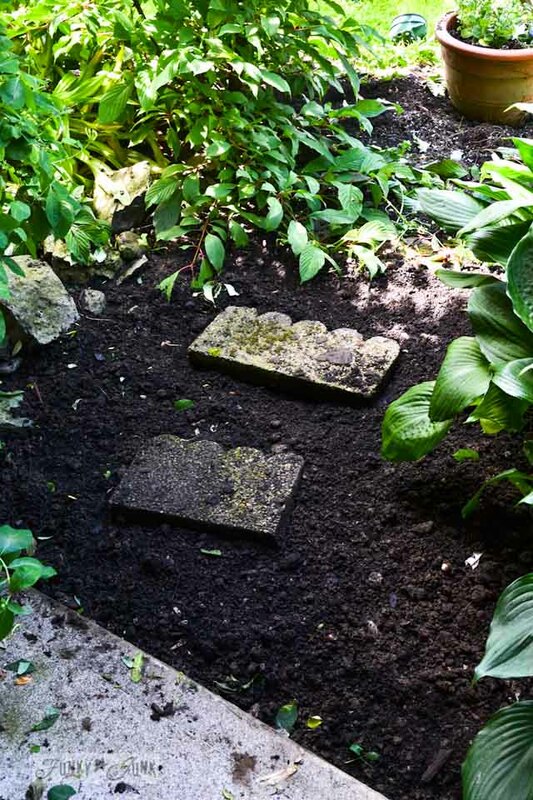 If the pallets is placed directly on the soil/mud, won’t the moisture make it rot out sooner? Totally could rot in time, Susan, but I’m not too concerned. I’ll just replace them when they do. Or think of something different.. that’s fun too! That’s true!! Pallets are plentiful and the price is right – FREE!!! We also pick them up to cut up for our firepit. So many ideas out there. 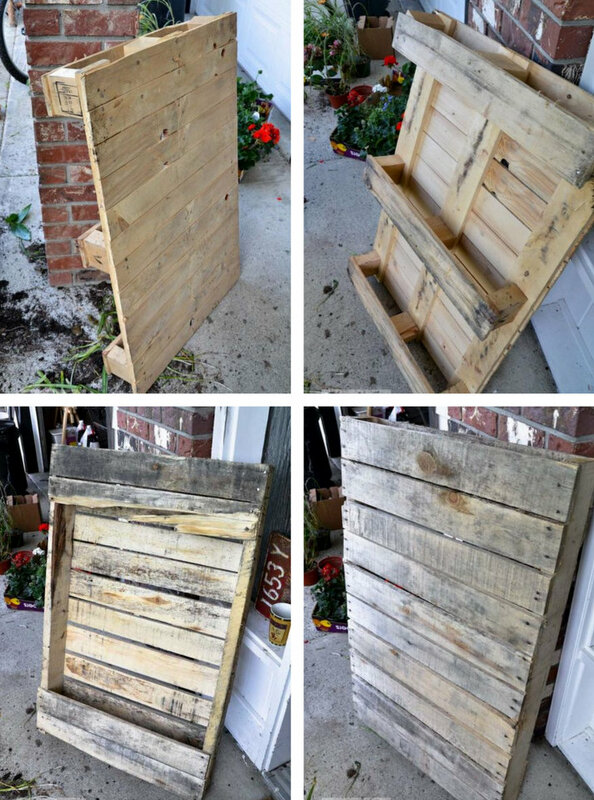 I have a Pinterest board for pallets & crates for future ideas of ways to use them. You did great!!! I agree, the flower spillage at the end looks great and wsa a good idea. Love, love this! I think you could turn s_ _ _ into a rose. You go girl. you are genius! love most of your ideas, have implemented several into my life. i’m not talented like you, but i do muddle along and am happy with my results. love your new critters. Hi, both walkways look great- I always see so many free on Craigslist and wish I could think of something to do with them. 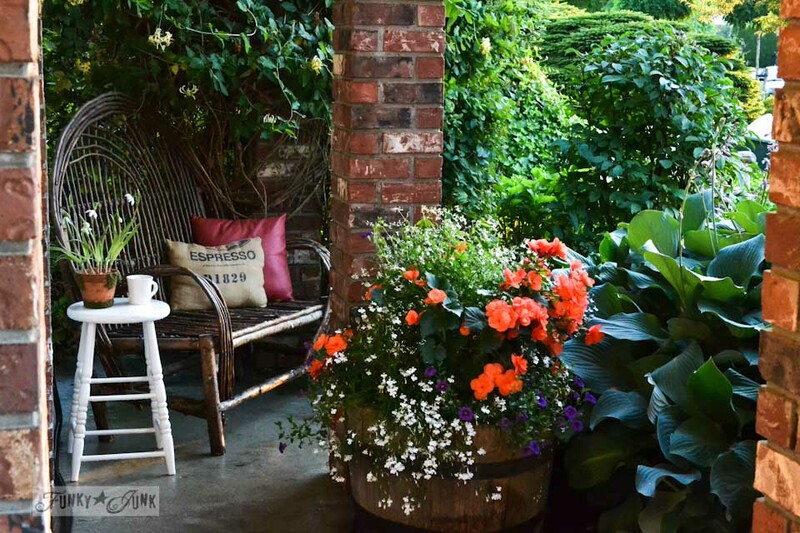 You have given me ideas for my back yard by creating a wonderful, cozy nook for yourself. Also, the barrel is beautiful. Back to the wood possibly rotting. Where i live, the wood would be rotted by fall. The humidity is vicious here. i am wondering if covering with a sealer or something like that would work. Also, i don’t have the strength of a gnat. How would you suggest that i take the pallet apart without doing myself in? BTW. . .Bravo!!! Your walkways are absolutely BEAUTIFUL! You are an amazingly talented lady. Also, you are a talented writer too. Your blogs are interesting, funny, and you keep me coming back for more. Glad i found you. Hey Louise, I can’t take them apart myself either unless the nails are of the straight variety. If they are twisted, I pass. There are some special tools one can use to dismantle a pallet. Just google it and you’ll find all kinds of weird stuff out there. Many use a sawzall with a metal blade as well so you just saw the nails vs. prying the works apart. I luck out and frequent a place where they must rip open large cartons and find lots of loose boards. Other than that, for a wood walkway, you could always just pick up new wood and cut down to size for something like that. Unless you use the entire pallet like I did in this tutorial of course! Just watch for smaller ones. Thanks for the kudos, much appreciated! LOVE your pallet uses!!! Both of these are great! all your ideas are great!!! luv em all. Your walkway looks great! And I love the flowers, so beautiful! I love your yard and your porch! It looks so cozy and inviting! I love the pallet walk way that is so cool! I am new here to your website so I havent explored every thing yet but what I have seen I love! Keep up the good work and posts! I enjoy reading them. Have a blessed day! It’s beautiful! We got a stray pallet from a Lowes delivery and wanted to do something with it. And you’ve inspired me…thanks. Did you do anything to treat the wood? I know pallet wood is low grade lumber so wonder if it needs extra protection from weather? 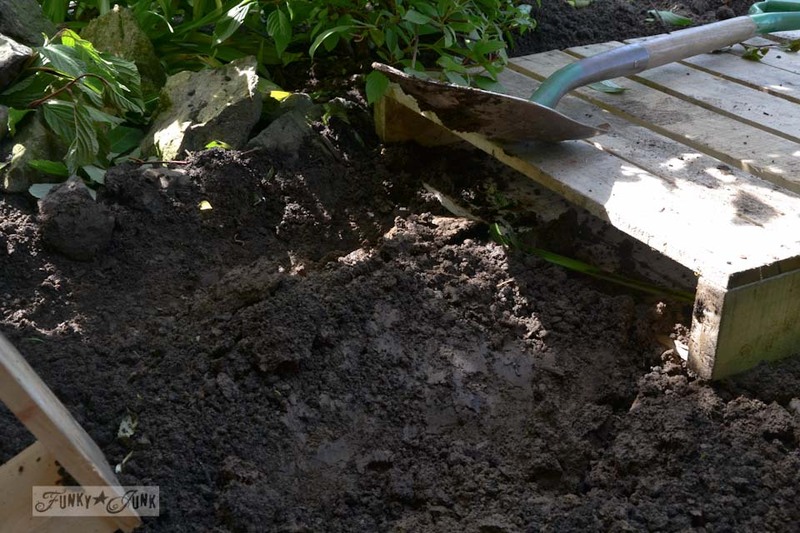 Many times, oh many many….Dig, pull,fabric, newspaper, cardboard, soil, mulch, plant. Veggies and flower beds. What is the secret to weed control!! This is not a joint effort at our place as the hubs is on the road 6 months of the year. Shall I cover it all in cement and mulch around perfect little baskets??? Love your Blog!! I’m telling ya, you are one creative gal! I love this idea. Adele from Logy Bay, Newfoundland. I just had the same brilliant idea when I was working in my yard! Came in to check for tips and I knew of course my idea was not original. Love what you did and Love, Love the idea for a high planter barrel.